The small guys outshine the big boys! According to the latest edition of Which? magazine, a recent survey showed small double glazing companies in a very favourable light versus the big, national players. They asked thousands of double glazing customers to rate the company they used, including brands Anglian, Everest and Safestyle, as well as independent traders. 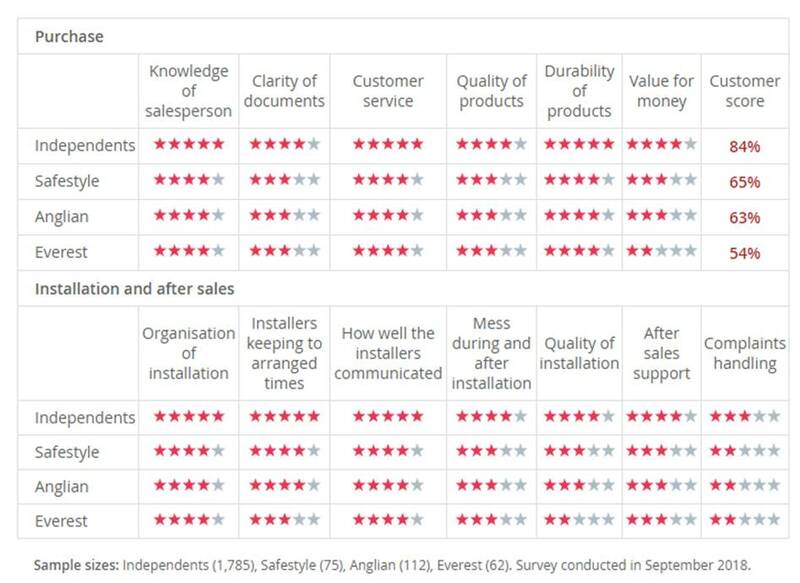 The answers, from 2,152 double glazing customers, reveal a big difference between the customer score for top and bottom-rated companies. Results also rate each company for a number of important factors, including customer service, quality of products and installation, knowledge and helpfulness of staff, and mess made during the installation. The results show that you should be considering independent traders over the well-known brands. Customers who used local, independent companies gave them an overall customer score of 84%. The three big-name brands came as much as 30 points lower. Safestyle fared best out of the three with 65%. Anglian came just behind it with 63%, while Everest came bottom with 54%. As well as achieving a high customer score of 84%, the independents got a maximum of five stars for a number of factors, while none of the brands achieved five stars for anything. The overall customer score is comprised from combining how satisfied people are with the company and whether they would recommend it. For all of the individual ratings, people were asked to define their experience using a seven-point scale, from ‘very poor’ to excellent. The independent, smaller companie were the only ones to score the maximum of five stars for any measure, which they did in a number of areas. This included customer service, installer timing and quality of products, showing that it’s customer often regard them as ‘very good’ or ‘excellent’. This report reinforces what we knew all along, buy local to get the best product, at the best price, supported by the best service. http://presswarmwindows.com/wp-content/uploads/2017/04/presswarm-windows-logo.png 0 0 michaelcotterell http://presswarmwindows.com/wp-content/uploads/2017/04/presswarm-windows-logo.png michaelcotterell2019-01-30 12:46:522019-01-30 12:47:02The small guys outshine the big boys! Orangery vs conservatory, what’s the difference?